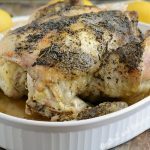 This Instant Pot Whole Chicken recipe shows you how to make rotisserie style chicken in the pressure cooker in less than an hour. Pop it under under the broiler for extra crispy skin and even more flavor! Sprinkle herbes de Provence, sea salt, pepper, garlic powder over chicken and in cavity, then stuff garlic cloves, onion and lemon into cavity. If not all pieces fit, add extra pieces of lemon or onion to the pot with the chicken. Place trivet in Instant Pot, pour stock or water into pot, and place chicken, breast side up on trivet. Recipe was made in 8-quart Instant Pot. For a 6-quart, use 1 cup of water.